LAREDO, TEXAS (AP) — As vehicles line up at the Border Patrol's checkpoint a half-hour drive's north of the U.S.-Mexico border, its agents have around 10 seconds to check each driver and decide which few they will stop for additional inspection. It's a situation challenged constantly by smugglers, sometimes with deadly consequences. In July, 10 migrants died after a tractor-trailer packed with people made it through Laredo North, only to be discovered two hours later in a Walmart parking lot in San Antonio. Dozens of others streamed out of the trailer, gasping for air. The Border Patrol considers its 34 permanent interior checkpoints along the United States' southern border such as Laredo North a crucial layer of its strategy to stop smuggling. The checkpoints inside the U.S. can be up to 100 miles (161 kilometers) from any border, in addition to the ports of entry where people face inspection when coming into the country. But agents who work the Laredo North checkpoint say they're understaffed and sometimes overwhelmed by traffic. And while top Border Patrol officials say President Donald Trump's proposed border wall would help them cut the number of overall smuggling cases, some critics don't believe a wall would reduce illegal immigration and is drawing attention and money away from the checkpoints and other critical needs on the border. The Trump administration's latest budget proposal includes $1.6 billion to start building a wall that the administration has estimated will cost $18 billion. It asks for funding to hire more Border Patrol agents. It also includes $33 million to build a new Border Patrol station in Freer, Texas, northeast of Laredo. But it doesn't directly address needs at other checkpoints, and it proposes zeroing out new spending on tactical infrastructure like roads used by border agents and replacement border fencing. Rep. Henry Cuellar, a Laredo Democrat who sits on the U.S. House subcommittee directing homeland security funding, wants U.S. Customs and Border Protection, the Border Patrol's parent agency, to invest in additional scanners and other improvements at Laredo North, as well as interceptor boats and radio towers for remote border areas. Cuellar also says the government should fund retention bonuses to keep agents from leaving the patrol. "They're taking money away from proven law enforcement systems to put it into this 14th century solution," Cuellar said. A CBP spokesman declined to comment on the budget request. Built in 2006, Laredo North sits 30 miles (48 kilometers) north of the Rio Grande, the river separating the U.S. and Mexico in Texas. All of the approximately 9,000 daily vehicles that pass Laredo North's seven lanes get an inspection. An agent checks immigration documents and talks to each driver. A camera reads license plates, and another agent guides a dog around each passenger vehicle to search for hidden people or drugs. A fraction of vehicles are sent to a secondary inspection, where agents interview the driver further and search the vehicle. The occasional tractor-trailer is directed to a mobile X-ray machine that scans the interior of the truck. Agents do make big catches at such checkpoints. 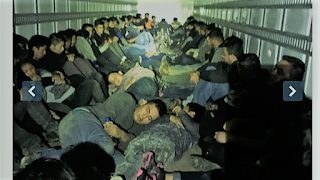 In January, agents at another Laredo checkpoint discovered 76 people inside a tractor-trailer that had been flagged for extra inspection. But the Border Patrol's largest union says agents have low morale and believe large loads of people and drugs are able to get through. "Our agents are understaffed and overworked," said Hector Garza, the Laredo representative of the National Border Patrol Council. "Even though they have all these forces against them, they go out there and try to do their best." "What is the route or what are the means people are going to take?" Correa-Cabrera said. "The ones that they perceive as safer." After illegal border crossings hit a 45-year low last year, according to the Border Patrol's statistics, the agency says apprehension numbers have started to rise. Despite the Trump administration's efforts to discourage people in Central America from migrating to the U.S., authorities in both the U.S. and Mexico are still catching trailers filled with people who sometimes pay $5,000 or more to cartel-controlled smugglers to be taken north. As for cases like the one in July where 10 people died, Jason Owens, the chief Border Patrol agent for the agency's Laredo sector, said his people are trained to make quick decisions about whether to order an extended inspection. But the number of vehicles at times "obscures the ability of the agents to concentrate on the legitimate threats," he said. "It hits all of us very hard," Owens said. "Nobody wants to see somebody perish trying to make it into this country to seek a better life for themselves."